The Nile Basin countries including Burundi, DR Congo, Egypt, Ethiopia, Kenya, Rwanda, South Sudan, Sudan, Tanzania and Uganda are endowed and produce agricultural commodities in all categories of (i) Industrial crops such as coffee, tea, sugar cane and perennial nuts such as cashew nuts; (ii) cereals and pulses such as maize, rice, wheat, beans, millet, sorghum, and nuts such as ground nuts, etc (iii) fruits and vegetable such as mangoes, oranges, pineapples and vegetables such as onions, tomatoes etc (iv) livestock and livestock products such as on-hoof cattle, sheep, goats, chicken and animal products of meet, milk, eggs, etc. (v) root tubers such as cassava, yam etc. The large scale production either rainfed or irrigated are mainly exportables for export earnings, while small scale production that are mainly rain-fed with minimal irrigation are for home consumption and only traded at local markets when there is surplus during seasons of over-production. Nile Basin countries’ policies on trade in agricultural in puts and outputs markets have a direct impact on products and productivity, as well as on the spatial distribution arbitrage from production (surplus) to consumption (deficit) areas. They affect trade at all levels, starting from where production takes place, to the national level, and the inter-regional trade among neighbouring countries, to the international trade in food commodities. The agricultural trade policies in the Nile Basin region indicate that countries in the region have agricultural trade policies mainstreamed in key policies at the regional level and at national level. At the regional level, the COMESA with 9 Nile basin countries, EAC with 6 Nile Basin counties and SADC with 2 Nile Basin countries, regional policies of liberalization are the main trade policies impacting on intra and extra regional agricultural trade. At the national level, countries have agricultural trade policies mainstreamed in various agricultural policies and strategies. Countries have measures and also take decisions that affect trade in food and agricultural products. The national agricultural policies generally aim at alleviating poverty, promoting food and nutrition security, promoting commercialization of smallholder agriculture, generating foreign exchange, and increasing agricultural production and productivity. The ‘issue of food security’ has remained on the national, regional and global development agenda of our times. Hunger has remained one of the leading causes of death globally, about 925 million people do not have enough food to eat, women although accounting to a slightly over half of the world’s population, account for over 60 percent of the worlds hungry and one out of every four children in the world is undernourished. About 13 percent of the world population is undernourished, with the majority of the undernourished persons living in developing countries, some of which are members of the Nile Basin. Among key food export commodities (according to the Common Market for Eastern and Southern Africa (COMESA) COMTrade) from the region are vegetables. tables, fruits and nuts, tea and coffee. Major exporters of vegetables and fruits from the region in 2012 were Egypt with 70.3%, Kenya with 14.5%, and Ethiopia with 6.9%, of the total in the region. Coffee exporting countries are mainly Ethiopia, Uganda and Kenya. Whereas coffee produced in Burundi and Ethiopia is mainly Arabica, Robusta accounts for over 85 % of Uganda’s coffee output. In 2012, coffee earnings in Ethiopia, Africa’s biggest producer, were worth US$ 825 million, a slight drop from the 2011 level of US$ 834 million. Ethiopian coffee exports were mainly destined to markets outside the Nile basin, in fact outside Africa such as Germany, Saudi Arabia, Belgium, USA and a number of other countries within the EU. On the other hand, Uganda’s exports of coffee during the same period were worth over US$ 371 million, down from US$ 435 million earned the previous year and this coffee was mainly exported to Sudan within the Nile Basin and outside the basin to Switzerland and Germany. 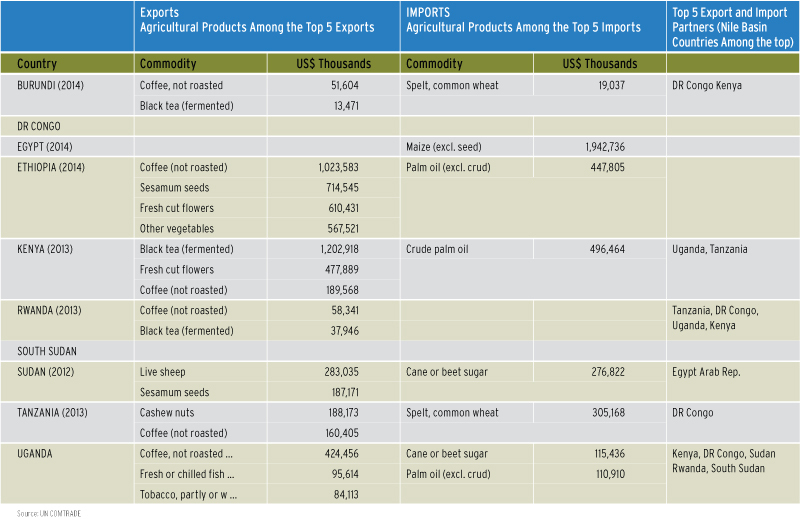 Generally, most of the exports are to destinations outside the Nile Basin region. In the case of tea, major exporters of this produce from the Nile Basin region are Kenya, and Uganda. Kenya’s exports of tea in 2012 were worth almost US$ 1.2 billion, mainly to the export markets of Egypt in the Nile Basin and to Pakistan the United Kingdom and Afghanistan markets outside the Nile Basin. Uganda exported tea worth US$ 50 million in 2012.